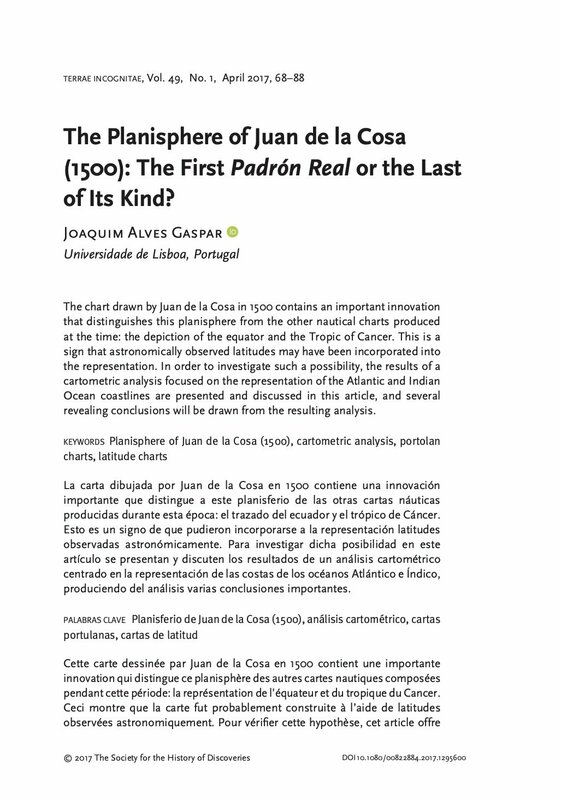 The Planisphere of Juan de la Cosa (1500): The First Padrón Real or the Last of Its Kind? The chart drawn by Juan de la Cosa in 1500 contains an important innovation that distinguishes this planisphere from the other nautical charts produced at the time: the depiction of the equator and the Tropic of Cancer. This is a sign that astronomically observed latitudes may have been incorporated into the representation. In order to investigate such a possibility, the results of a cartometric analysis focused on the representation of the Atlantic and Indian Ocean coastlines are presented and discussed in this article, and several revealing conclusions will be drawn from the resulting analysis.